This article is about the 2018 film. For the 2017 film starring Domhnall Gleeson, see Goodbye Christopher Robin. Christopher Robin is a 2018 American fantasy comedy-drama film directed by Marc Forster and written by Alex Ross Perry, Tom McCarthy, and Allison Schroeder, from a story by Greg Brooker and Mark Steven Johnson. The film is inspired by A. A. Milne and E. H. Shepard's Winnie-the-Pooh books and is a live-action/CGI follow-up of the Disney franchise of the same name. The film stars Ewan McGregor as the title character alongside Hayley Atwell and the voices of Jim Cummings, Brad Garrett, Nick Mohammed, Peter Capaldi, Sophie Okonedo, Sara Sheen, and Toby Jones. The story follows an adult Christopher Robin as he has lost his sense of imagination, only to be reunited with his old stuffed bear friend, Winnie-the-Pooh. Plans of a live-action Winnie the Pooh adaptation were announced in April 2015, and Forster was confirmed as director in November 2016. McGregor signed on as Christopher Robin in April 2017 and principal photography began in August of that year in the United Kingdom, lasting until November. Christopher Robin had its premiere in Burbank, California on July 30, 2018. Released in the United States on August 3, 2018, by Walt Disney Studios Motion Pictures, the film grossed over $197 million worldwide, becoming the highest-grossing film in the Winnie the Pooh franchise and received mostly positive reviews from critics, with praise for McGregor, Cummings, and Garrett's performances, musical score, and visual effects. The film received an Academy Award nomination for Best Visual Effects at the 91st Academy Awards. Christopher Robin is leaving for boarding school, so his friends from the Hundred Acre Wood – Winnie the Pooh, Tigger, Piglet, Eeyore, Kanga, Roo, Owl, and Rabbit – throw a goodbye party. Christopher comforts Pooh and tells him that he will never forget him. Christopher goes to boarding school, after which he grows up, meets and marries architect Evelyn, with whom he has daughter Madeline. He serves in the British Army during World War II. After the war, he works as an efficiency expert at Winslow Luggages. He neglects his family due to his demanding job and plans on sending Madeline to boarding school. With the company hitting hard times, Giles Winslow Jr. tells Christopher to decrease expenditures by 20%, largely by choosing which employees to lay off, and to present his plan on Monday. This causes Christopher to miss joining his family at their countryside cottage in Sussex for a summer-ending weekend. When Pooh awakens and is unable to find his friends, he decides to travel through Christopher's door and finds himself in London. He reunites with Christopher, who is shocked to see Pooh, but takes him back to his London home. After a night and morning of chaos, Christopher escorts the bear back to Sussex on the next train. After sneaking past Christopher's cottage, the two enter the Hundred Acre Wood. Christopher becomes exasperated by Pooh's absent-mindedness and fear of Heffalumps and Woozles. Christopher tells Pooh that he is not a child anymore, before the two get separated in the fog. Christopher discovers Eeyore and Piglet, who lead him to the others, hiding in a log out of fear of a Heffalump. Unable to persuade his friends that he is truly Christopher Robin, he pretends to defeat a Heffalump to convince them. Finally believing that it is Christopher Robin, they joyfully greet him. When they reunite with Pooh at their meeting spot, Christopher apologizes for getting upset earlier. Christopher tells Pooh how lost he feels, but Pooh reminds him that they have found each other and comforts him with a hug. The next morning, Christopher, realising how late he is, rushes from the Hundred Acre Wood to make his presentation. He encounters his family and, unable to tell them about his old friends in the Hundred Acre Wood, leaves. Pooh realizes that Tigger removed Christopher's paperwork when drying his briefcase, so Pooh, Tigger, Piglet and Eeyore decide to travel to London to give it back. They meet Madeline, who recognizes them from her father's drawings. She joins them, wanting to dissuade her father about boarding school; Evelyn follows after discovering a note Madeline left. At the meeting, Christopher discovers that his briefcase contains items from the woods that Tigger left for him. Evelyn arrives and Christopher joins her to search London for Madeline. Madeline's group stow away in Winslow company crates, but Tigger, Eeyore and Piglet are accidentally thrown out, and they encounter Christopher and Evelyn in the process. Madeline and Pooh arrive near the Winslow building and reunite with Christopher's group, but Madeline accidentally trips on the stairs and loses all but one of the papers, upsetting her and Pooh. Christopher assures Madeline of her importance to him and that he will not send her to boarding school. Using his remaining paper, Christopher improvises a plan involving reducing the prices of luggage, giving employees paid leave, and selling their luggage to everyday people to increase demand. Winslow Jr., who instead proposed firing some of the staffs, dismisses the idea; Winslow Sr. warms to it and agrees to the plan. Winslow Jr. is humiliated as Christopher points out that he contributed nothing to the plan, having been golfing all weekend. Christopher with Pooh, Tigger, Eeyore and Piglet, finally takes his family into the Hundred Acre Wood to meet the rest of his friends. In a mid-credits scene, the employees of Winslow's are seen having fun at the beach while Richard M. Sherman performs "Busy Doing Nothing" on a piano. Pooh, Piglet, Eeyore and Tigger are relaxing on beach chairs with Eeyore saying "Thank you for noticing me". Ewan McGregor as Christopher Robin: A businessman working as an efficiency expert at Winslow Luggages who was once an imaginative boy. McGregor said that "[he] was very charmed by the script and the fact that they take Christopher Robin as a man [of his] age and that Winnie the Pooh comes back to him in a difficult time in his life. [McGregor found] it really moving", and said that "[Christopher] recognizes that he would like to be closer to [his daughter]", and said that "there was something of coming together as a father and a daughter" that appealed to him as a father of 4 daughters. McGregor said that "[the actors' performances] wouldn't be nearly as effective, wouldn't feel as real and good, if it wasn't for [the voice cast]", as he has someone he can play opposite to. McGregor stated that "[he] really [likes] playing [Chistopher Robin], and [he] really [felt] like [he] wanted to play" the character. Atwell said that McGregor's performance can let people see "the Man, but underneath [the audience] see the boy that he was". Director Marc Foster said that McGregor was "the perfect Christopher Robin", as he felt he "was able to capture [the] spirit that was needed to portray Christopher Robin as an adult person". Hayley Atwell as Evelyn Robin: Christopher's wife who works as an architect. Foster said that "it was important for [him] to find" in Atwell "a very strong woman" that also is relatable and "can stand up for herself and dosen't play a victim or play into that because ultimately when [Christopher Robin] denies his love to [Evelyn], she's still a woman who believes in him, but also strong enough to stand up for herself". McGregor was happy when he was told that Hayley Atwell was also cast for the film, having previously worked together on Cassandra's Dream. Atwell said that the film's story is "a charming one, and a funny one, and ultimately a story about a man coming back to his family" which she felt will appeal audiences. Bronte Carmichael as Madeline Robin: Christopher's daughter. McGregor said that Bronte's performance is "is so natural" and "really really good", a sentiment which Atwell shared, stating that she was "sweet", and felt that "[her performance] was really moving to watch" and that she "embodied the character of Madeline with the same feel that the books had with Christoper Robin". Carmichael called the film something "good for adults and for children", with adults finding it "emotional and moving", while the film's humor will make audiences "smile and really enjoy it". She also hoped adult audiences "will reconnect with children and have more family trips, and maybe play a few more games with the kids" after watching the film, and felt it has "a really special message". Foster called Carmichael "one of the very most gifted children actor [he] ever worked with". Winnie the Pooh: A honey-loving teddy bear who lives in the Hundred Acre Wood. Atwell said that many of Pooh's lines were taken from A. A. Milne's original books, which she felt it managed to capture "the wisdom of Pooh" whom she said is "a bear of very little brain, but also a bear of very big heart". Kristen Burr felt that "They were so lucky to get Jim, as soon as the audience hear him read his lines, a feeling of nostalgia washes over the audience and makes them smile". Tigger, a toy tiger who lives in the Hundred Acre Wood who loves to bounce around on his tail like a spring. Brad Garrett as Eeyore, a pessimistic toy donkey in the Hundred Acre Wood who always loses his tail and talks with a deep depressing voice and tone. Garrett previously voiced the character in the 1995 video game Disney's Animated Storybook: Winnie the Pooh and the Honey Tree. Nick Mohammed as Piglet, a diminutive toy pig in the Hundred Acre Wood who is afraid of everything but has a big heart. Peter Capaldi as Rabbit, a rabbit who is obsessive-compulsive and a vegetable farmer in the Hundred Acre Wood. Sophie Okonedo as Kanga, a toy kangaroo in the Hundred Acre Wood who is the mother of Roo. Sara Sheen as Roo, a toy joey in the Hundred Acre Wood who is the child of Kanga. Toby Jones as Owl, the wise owl of the Hundred Acre Wood. 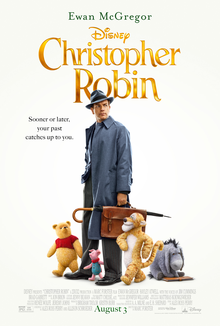 In 2003, Brigham Taylor, inspired by the last chapter of The House at Pooh Corner, pitched to Disney an idea about a Winnie the Pooh film focusing on an adult Christopher Robin. However, due to other Pooh projects being in development at the time, the project was not pitched for a film. Kristin Burr later convinced Taylor to resurrect the project, which the two then started working on. On April 2, 2015, Walt Disney Pictures announced that a live-action adaptation based on the characters from the Winnie the Pooh franchise was in development which would take a similar pattern to 2010's Alice in Wonderland, 2014's Maleficent, and 2015's Cinderella. Alex Ross Perry was hired to write the script and Brigham Taylor hired to produce the film, about an adult Christopher Robin returning to the Hundred Acre Wood to spend time with Pooh and the gang. On November 18, 2016, it was reported that the studio had hired Marc Forster to direct the film, titled Christopher Robin, and the project would have "strong elements of magical realism as it seeks to tell an emotional journey with heartwarming adventure." On March 1, 2017, Tom McCarthy was hired to rewrite the existing screenplay. On April 26, 2017, Ewan McGregor was announced to play the title character while Allison Schroeder was recruited to do additional work on the script. On June 22, 2017, it was revealed that Gemma Arterton had been in negotiations to portray the wife of the title character but, ultimately, she passed on the role. In August and September 2017, Hayley Atwell and Mark Gatiss were cast as Evelyn, Christopher Robin's wife and Giles Winslow, Christopher Robin's boss, Nick Mohammed was cast as Piglet, while Jim Cummings was confirmed to be reprising his role as Winnie the Pooh, and Brad Garrett was revealed to be voicing Eeyore In January 2018, Peter Capaldi, Sophie Okonedo and Toby Jones were cast as Rabbit, Kanga and Owl respectively. Chris O'Dowd was originally set to voice Tigger, but his lines were re-dubbed by Cummings, who played the character partially since 1988 and fully since 2000, after audiences in test screenings reacted negatively towards how he voiced the character. Principal photography on the film began in early August 2017, in the United Kingdom, and concluded on November 4, 2017. Much of the filming of the Hundred Acre Wood scenes took place at Ashdown Forest, which was the original inspiration for the setting, as well as Windsor Great Park, and at Shepperton Studios. Jóhann Jóhannsson was hired to score the film, shortly before his death on February 9, 2018. The film is dedicated to his memory. Klaus Badelt was announced as taking over composing duties for Jóhannsson, but the score was ultimately written by Jon Brion and Geoff Zanelli. At an Academy event, songwriter and Disney Legend Richard M. Sherman revealed that the film would feature the iconic "Winnie the Pooh" theme, and that he was working on three new songs for the film, titled "Goodbye Farewell", "Busy Doing Nothing" and "Christopher Robin", with the first one being performed by the voice cast, and the last two by Sherman. Sherman said that he found "very special to be back at the Hundred Acree Wood" as "Winnie the Pooh became a dear friend of [his] when Walt gave [to the Sherman Brothers] the assignment to write songs for the ﬁrst Winnie the Pooh short ﬁlm", and felt the film has "a wonderful story". Sherman said that he wrote "Busy Doing Nothing" based on the fact that "[Pooh] is always busy. Doing nothing. And he's very proud of the fact he does nothing", and said "it was fun to write". He called the song "Christopher Robin" "a sweet, nostalgic, memory of a love song between Winnie the Pooh and Christopher [Robin]", and said the lyrics "are part of the storyline [of the film]". "Up, Down and Touch the Ground" and "The Wonderful Thing About Tiggers", both written by Richard and his brother Robert B. Sherman and performed by Cummings as Pooh and Tigger, respectively, are also included in the film. The film's soundtrack, featuring Zanelli and Brion's score, and Sherman's new songs, was released on August 3, 2018. All tracks written by Geoff Zanelli and Jon Brion except where noted. Visual effects studios Framestore and Method Studios, are leading the animation for the Hundred Acre Wood characters, with Overall Vfx Supervisor Chris Lawrence and Animation Supervisor Michael Eames leading the teams. Christopher Robin premiered in Burbank, California on July 30, 2018, and was released on August 3, 2018 by Walt Disney Studios Motion Pictures. The film was denied release in China, as some have speculated it was due to Chinese netizens have drawn comparisons between Winnie the Pooh and Chinese leader Xi Jinping since mid 2017. Other industry insider speculates it was likely due to other reasons such as the film's size and the presence of other Hollywood films in the market. The first teaser poster of the film was released on March 5, 2018, and the first teaser trailer was unveiled the following day. On May 24, 2018, it was announced that the full trailer would premiere the following day during McGregor's appearance on The Ellen DeGeneres Show. Christopher Robin was released on DVD and Blu-ray on November 6, 2018. The film debuted in second place behind Incredibles 2 on the NPD VideoScan First Alert chart for the week ending on November 11, 2018. The movie premiered on Netflix USA and Canada on March 5, 2019. Christopher Robin grossed $99.2 million in the United States and Canada, and $98.4 million in other territories, for a total worldwide gross of $197.6 million. In the United States and Canada, Christopher Robin was released alongside The Spy Who Dumped Me, The Darkest Minds, and Death of a Nation: Can We Save America a Second Time?. The film made $9.5 million on its first day, including $1.5 million from Thursday night previews. It went on to debut to $24.6 million, finishing second at the box office behind holdover Mission: Impossible – Fallout. The film fell 47% to $13 million in its second weekend, finishing third behind The Meg and Mission: Impossible – Fallout. The film finished sixth in its third through fifth weekends, grossing $8.9 million, $6.3 million, and $5.3 million, respectively. On the review aggregation website Rotten Tomatoes, the film has an approval rating of 72% based on 245 reviews, with an average rating of 6.17/10. The website's critical consensus reads, "Christopher Robin may not equal A. A. Milne's stories – or their animated Disney adaptations – but it should prove sweet enough for audiences seeking a little childhood magic." On Metacritic, the film has a weighted average score of 60 out of 100, based on 43 critics, indicating "mixed or average reviews". Audiences polled by CinemaScore gave the film an average grade of "A" on an A+ to F scale, while PostTrak reported filmgoers gave it 4.5 out of 5 stars. Ben Kenigsberg of The New York Times reviewed the film this way: "Once Christopher Robin softens its insufferable, needlessly cynical conception of the title character, it offers more or less what a Pooh reboot should: a lot of nostalgia, a bit of humor and tactile computer animation." And David Sims of The Atlantic wrote, "It's an odd, melancholic experience that at times recalls Terrence Malick as it does A. A. Milne, but there will certainly be some viewers in its exact wheelhouse." Michael Phillips of the Chicago Tribune gave the film 3 out of 4 stars and said, "Pooh's wisdom and kindness cannot be denied. The same impulses worked for the two Paddington movies, God knows. Christopher Robin isn't quite in their league, but it's affecting nonetheless." Richard Lawson of Vanity Fair gave the film a positive review and heavily praised the voice performance from Cummings, calling it "Oscar-worthy". Overall, he said, "As Winnie the Pooh (and Tigger too), the veteran voice actor gives such sweet, rumpled, affable life to the wistful bear of literary renown that it routinely breaks the heart. Cummings's performance understands something more keenly than the movie around it; he taps into a vein of humor and melancholy that is pitched at an exact frequency, one that will speak to child and adult alike. His Pooh is an agreeable nuisance and an accidental philosopher, delivering nonsensical (and yet entirely sensible) adages in a friendly, deliberate murmur ringed faintly with sadness. I wanted to (gently) yank him from the screen and take him home with me, his fuzzy little paw in mine as we ambled to the subway, the summer sun fading behind us. He's a good bear, this Pooh." Conversely, Alonso Duralde of TheWrap called the film "slow and charmless" and wrote, "What we're left with is a Hook-style mid-life crisis movie aimed at kids, designed to shame parents who spend too much time at the office and not enough with their families." Helen O'Hara of Empire magazine gave the film a 2 out of 5 stars and said "Everyone's trying hard, but they can't quite live up to the particularly gentle, warm tone of Pooh himself. Unlike the bear of very little brain, this is a film pulled in different directions with entirely too many thoughts in its head". ^ a b c d e f g h i j "Christopher Robin Press Kit" (PDF). Walt Disney Studios. Retrieved July 27, 2018. ^ "Christopher Robin". AMC Theatres. Retrieved July 10, 2018. ^ McClintock, Pamela (August 5, 2018). "Weekend Box Office: 'Mission: Impossible 6' Wins More Cuddles Than 'Christopher Robin' With $35M". The Hollywood Reporter. Prometheus Global Media. Retrieved August 10, 2018. ^ Rubin, Rebecca (August 13, 2018). "Box Office: 'Mission: Impossible – Fallout' Cruises Past 'Christopher Robin'". Variety. Penske Business Media. Retrieved August 5, 2018. ^ a b "Christopher Robin". Box Office Mojo. IMDb. Retrieved March 24, 2018. ^ "Disney's Christopher Robin" (PDF). Walt Disney Studios. May 4, 2018. Retrieved June 11, 2018. ^ a b "Christopher Robin Premiere, LA". Average Socialite. July 30, 2018. Retrieved July 30, 2018. ^ Express Web Desk (August 10, 2018). "Christopher Robin review roundup: This Disney film receives mostly positive reviews". The Indian Express. Retrieved August 21, 2018. ^ a b c d e "CHRISTOPHER ROBIN Ewan McGregor Interview". YouTube. Retrieved January 19, 2018. ^ a b c d e CHRISTOPHER ROBIN "Evelyn Robin" Hayley Atwell Interview. YouTube. Event occurs at[time needed]. Retrieved January 19, 2018. ^ The DisInsider [@TheDisInsider] (October 12, 2017). "Orton O'Brien will play a young Christopher Robin. In Disney's live action adaptation of Winnie The Pooh starring Ewan McGregor" (Tweet). Retrieved August 21, 2018 – via Twitter. ^ "CHRISTOPHER ROBIN | On-set visit with Marc Forster "Director"". YouTube. Retrieved January 31, 2018. ^ a b "CHRISTOPHER ROBIN "Madeline Robin" Bronte Carmichael Interview". YouTube. Retrieved January 31, 2018. ^ Rosseboom, Matt (July 23, 2018). "Journey back into the Hundred Acre Wood with 'Christopher Robin' and voice-acting legend Jim Cummings". Attractions Magazine. Dream Together Media. Retrieved July 27, 2018. ^ Fleming, Mike Jr. (April 2, 2015). "Disney Sets Live-Action 'Winnie The Pooh' Film; Alex Ross Perry To Write". Deadline Hollywood. Penske Business Media. Retrieved September 17, 2017. ^ Kit, Borys (November 18, 2016). "Marc Forster to Direct Live-Action Movie About Winnie the Pooh's Pal, 'Christopher Robin' (Exclusive)". The Hollywood Reporter. Prometheus Global Media. Retrieved September 17, 2017. ^ McNary, Dave (March 1, 2017). "'Spotlight's' Tom McCarthy to Re-Write Disney's Live-Action 'Christopher Robin'". Variety. Penske Business Media. Retrieved September 17, 2017. ^ Lesnick, Silas (April 26, 2017). "Ewan McGregor Will Headline Disney's Christopher Robin Movie". ComingSoon.net. Mandatory. Retrieved September 17, 2017. ^ Ford, Rebecca; Kit, Borys (April 26, 2017). "Ewan McGregor to Star in Disney's 'Christopher Robin' (Exclusive)". The Hollywood Reporter. Prometheus Global Media. Retrieved September 17, 2017. ^ a b Kit, Borys (June 22, 2017). "Gemma Arterton No Longer In Talks to Join 'Christopher Robin'". The Hollywood Reporter. Prometheus Global Media. Retrieved September 17, 2017. ^ Kroll, Justin (August 2, 2017). "'Agent Carter' Star Hayley Atwell Joins Ewan McGregor in Disney's 'Christopher Robin' (EXCLUSIVE)". Variety. Penske Business Media. Retrieved September 17, 2017. ^ Schaefer, Sandy (August 14, 2017). "Christopher Robin: Winnie the Pooh, Eeyore & More Possibly Cast". Screen Rant. Retrieved September 17, 2017. ^ Mueller, Matthew (August 30, 2017). "Disney Casts Piglet For Live-Action Christopher Robin Movie". Comicbook.com. Retrieved September 17, 2017. ^ a b C, Jake (May 25, 2018). "Chris O'Dowd Is No Longer Playing Tigger In Disney's 'CHRISTOPHER ROBIN' – Here's Why. (EXCLUSIVE)". Discussing Film. Retrieved July 12, 2018. ^ Mescobar, Aaron (May 27, 2018). "Chris O'Dowd Replaced As Tigger In 'Christopher Robin' By Original Voice Actor Jim Cummings". We are Geeks of Color. Retrieved June 19, 2018. ^ Daniels, Nia (August 9, 2017). "Disney's Christopher Robin starts filming in the UK". KFTV. Media Business Insight. Retrieved September 17, 2017. ^ Wilson, Callum (August 7, 2017). "Disney is shooting a film in Dover and you could be a paid extra". Kent Live. Local World. Archived from the original on August 7, 2017. Retrieved September 17, 2017. ^ Forster, Marc (November 4, 2017). "#thatsawrap on #christopherrobin Thank you to my outstanding cast and crew for truly one of the most amazing filmmaking experiences of my life". Instagram. Retrieved June 20, 2018. ^ Roxborough, Scott (February 14, 2018). "Johann Johannsson's Death Leaves Friends Shocked, Questions Unanswered". The Hollywood Reporter. Prometheus Global Media. Retrieved May 7, 2018. ^ Mithaiwala, Mansoor (March 6, 2018). "Disney's Christopher Robin Trailer Arrives". Screen Rant. Retrieved March 7, 2018. ^ "Jon Brion to Score Marc Forster's 'Christopher Robin' - Film Music Reporter". Filmmusicreporter.com. Retrieved January 12, 2019. ^ Zanelli, Geoff (July 16, 2018). "I'm happy I could step into the Hundred Acre Wood and be part of this special movie! Loved spending time with these three, and working alongside the uber-talented Jon Brion. Christopher Robin comes out August 3rd! — Geoff Zanellipic.twitter.com/jUP8PdaN6G". Twitter. Retrieved January 12, 2019. ^ King, Susan (June 18, 2018). "Walt Disney's favorite composers, the Sherman brothers, get a star-filled film academy salute". Los Angeles Times. Retrieved June 19, 2018. ^ a b c "Christopher Robin Interview with Songwriter Richard Sherman". YouTube. Retrieved December 11, 2018. ^ "'Christopher Robin' Soundtrack to Be Released - Film Music Reporter". Filmmusicreporter.com. Retrieved January 12, 2019. ^ Amidi, Amid (May 28, 2018). "New 'Christopher Robin' Trailer Reveals Extensive Look At Animation". Cartoon Brew. Retrieved June 19, 2018. ^ D'Alessandro, Anthony (September 12, 2017). "'Star Wars: Episode IX' Moves To Dec. 2019, Disney's Christopher Robin Project Opens Next August". Deadline Hollywood. Penske Business Media. Retrieved September 17, 2017. ^ Siegel, Tatiana (August 3, 2018). "Disney's 'Christopher Robin' Won't Get China Release Amid Pooh Crackdown (Exclusive)". The Hollywood Reporter. Prometheus Global Media. Retrieved August 21, 2018. ^ Reuters Staff (August 8, 2018). "China denies entry to Disney's Winnie the Pooh film: source". Reuters. Thomson Reuters. Retrieved August 21, 2018. ^ Nguyen, Crystal (March 5, 2018). "The Casting and New Poster for Disney's Christopher Robin Are Here". Oh My Disney. Disney. Retrieved March 6, 2018. ^ Walt Disney Studios (March 6, 2018). "Christopher Robin Official Teaser Trailer". YouTube. Retrieved March 6, 2018. ^ Disney [@Disney] (May 24, 2018). "Sooner or later, the past catches up to you. Tune in to @TheEllenShow tomorrow for the new trailer for Disney's #ChristopherRobin" (Tweet). Retrieved May 24, 2018 – via Twitter. ^ Prange, Stephanie (October 10, 2018). "Disney's 'Christopher Robin' Coming to Disc and Digital Nov. 6". Media Play News. JCH Media Inc. Retrieved October 10, 2018. ^ "'Incredibles 2' Is Super on Home Video Charts". Mediaplaynews.com. November 15, 2018. Retrieved December 1, 2018. ^ "What's new on Netflix Canada, Amazon Prime Video and Crave: March 2019". www.msn.com. Retrieved March 4, 2019. ^ Associated Press (August 6, 2018). "Box-office top 20: 'Fallout' cruises past Winnie-the-Pooh". The Washington Post. The Washington Post Company. Retrieved August 13, 2018. ^ Brevet, Brad (August 13, 2018). "'The Meg' Devours Competition, Debuting with a Monster $146.9M Globally". Box Office Mojo. IMDb. Retrieved August 13, 2018. ^ Perry, Spencer (August 19, 2018). "Crazy Rich Asians Wins the Weekend with $25 Million Debut". ComingSoon.net. Mandatory. Retrieved August 20, 2018. ^ Associated Press (August 27, 2018). "Box office top 20: 'Crazy Rich Asians' scores again". The Washington Post. The Washington Post Company. Retrieved August 27, 2018. ^ "August 31-September 2, 2018". Box Office Mojo. Retrieved September 5, 2018. ^ "Christopher Robin (2018)". Rotten Tomatoes. Fandango Media. Retrieved September 26, 2018. ^ "Christopher Robin Reviews". Metacritic. CBS Interactive. Retrieved August 15, 2018. ^ Kenigsberg, Ben (August 2, 2018). "Review: In 'Christopher Robin,' the Hundred Acre Wood Grows Up". The New York Times. The New York Times Company. Retrieved August 21, 2018. ^ Sims, David (August 3, 2018). "Christopher Robin Is as Deeply Weird as It Is Charming". The Atlantic. Retrieved August 21, 2018. ^ Phillips, Michael (August 3, 2018). "'Christopher Robin' review: Winnie the Pooh reminds a middle-age workaholic the joys of doing nothing". Chicago Tribune. Retrieved August 3, 2018. ^ Lawson, Richard (August 2, 2018). "There's an Oscar-Worthy Performance in Disney's Christopher Robin". Vanity Fair. Condé Nast. Retrieved August 21, 2018. ^ Durande, Alonso (August 2, 2018). "'Christopher Robin' Film Review: A.A. Milne's Young Hero Has a Hundred-Acre Mid-Life Crisis". TheWrap. Retrieved August 3, 2018. ^ O'Hara, Helen (August 2, 2018). "Christopher Robin". Empire. Retrieved August 21, 2018. ^ Fear, David (August 3, 2018). "'Christopher Robin' Review: Ewan McGregor, Meet a Bear Named Pooh". Rolling Stone. Retrieved August 21, 2018. ^ Forsgren, Adam (August 4, 2018). ""Christopher Robin" nearly buries best qualities under blanket of nostalgia". East Idaho News. Retrieved August 21, 2018. ^ Zacharek, Stephanie (August 3, 2018). "'Christopher Robin' Is as Much a Movie For Adults as It Is For Kids". Time. Retrieved August 21, 2018. ^ Lowry, Brian (August 2, 2018). "'Christopher Robin' serves up sweet take on Winnie the Pooh". CNN Entertainment. CNN. Retrieved August 21, 2018. ^ "People's Choice Awards 2018: The nominees". USA Today. Gannett. September 24, 2018. Retrieved September 25, 2018. ^ Meares, Joel (January 11, 2019). "Roma, Black Panther, and Netflix Dominate the 20th Golden Tomato Awards". Rotten Tomatoes. Retrieved January 11, 2019. ^ Dino-Ray Ramos (December 3, 2018). "Annie Awards: 'Incredibles 2', 'Ralph' And 'Spider-Verse' Top Nominations". Deadline Hollywood. Retrieved December 4, 2018. ^ Romano, Nick (January 22, 2019). "Oscar nominations 2019: See the full list". Entertainment Weekly. Retrieved January 23, 2019.